Polacios is another favorite spot. It has calm waters and a nice lauch site with a hose for clean up on site. 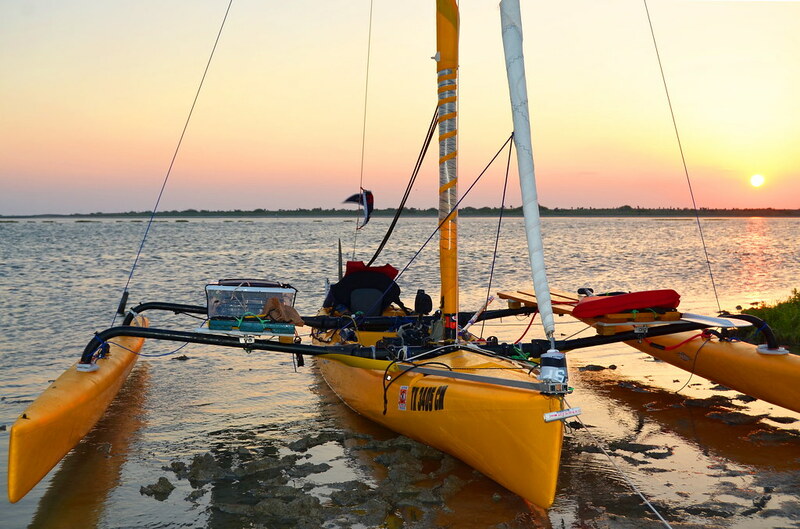 I also sail out of San Leon frequently using Clear lake as my backup if winds suprise me with a rough bay. Awesome, I'm definitely down for a Palacious trip if either/both of you are in. Maybe sometime after the holidays in January. I'm thinking we could set up a couple of different days, that way if the first one doesn't work out due to weather, then we could fall back on the second. I had a request for some pics of my jib/bow reinforcement setup, so I thought I'd post some details of my jib setup. The first two are older pics, and the last three are of my current setup, which I'm tweaking again. I'm adding ball bearings to my homemade furler using some old bearings from the mast furler. The idea for the bow reinforcement came from other members of this form, so a thanks goes out to them. My iteration uses 3/4" aluminum square tubing. The tubing is bolted to the front aka using stainless u-bolts (1 3/4" I believe). At the front of the boat, the square tubing is sandwiched between two aluminum plates, the "sandwich" is bolted together. The bottom aluminum plate is screwed to the bow into the threaded inserts that were used for the eye strap that held the bow handle. The furling drum is bolted into the top aluminum plate. The cross brace is just 1/8" thick aluminum flat bar. It works but I would like to replace it with something more stiff. The bow reinforcement has been in use for about a year and has been holding up great. The only real drawback to it is that it makes it a bit harder to get to the bow hatch bungees. I bought the jib sail used. It is from a boat called a "2.4 Metre", is made by North Sails, and is about 35 square feet. To keep the luff of the sail somewhat twist free when furling, I later added plastic tubing that's used for the water supply for refrigerator ice makers. The tubing helps with the twist, has a low profile, is light weight and still allows me to fold the furled jib. When the winds pick up, or if I just want the jib out of the way for fishing or for maximum pointing into the wind, I'll furl the jib and drop it down to the deck. The coil of blue line that is wrapped up near the head of the furled jib are my shrouds. I added them to help support the mast from the higher loads of the jib. The "shrouds" are just paracord so they do stretch still allowing some flex from the mast. They do limit the flex, though, so the boat is noticeably less stable since the sail won't spill as much wind. However, when hiking out and keeping the boat as level as possible, they do give a bit of performance boost, even without the jib, since the mast isn't flexing and spilling as much wind as normal. The shrouds are attached to the halyard, so they come down with the jib to completely clear everything out of the way. I only use them if the jib is out or when I want a more active ride - hiking out and trying to squeeze out a little more speed. Even though my head sail is an actual jib, on the TI, it acts more like a mini screecher or reacher (whatever you want to call it). With the flexly mast, short bow and small centerboard, it's hard to get a head sail to boost windward performance. For maximum pointing ability I do not even use the head sail. Though, it does work great, and gives a noticeable boost anywhere more than 70 or 80 degrees off the wind. WARNINGS, CAUTIONS and SUCH STUFF!!! I DO NOT recommend any of this stuff unless you are VERY comfortable with your boat, are fine with capsizing and the winds are below 10 mph or so. Once the winds are above that, the boat is overloaded with too much sail and bogs itself down, driving itself into the bow wave. The shrouds decrease the stability of the boat and should not be used unless you are hiking out. In reality, they probably shouldn't be used at all. They are just something that I've been playing with, trying to squeeze out every little ounce of speed. A better option would be to get a Hobie 16! If only my garage was bigger! On another note, I've noticed when close-hauling, if I push and hold the fins from flat against the hull til they're aligned, I'll instantly get what I estimate another 2-3 degrees to wind with no apparent loss of speed, so I've modified a cassette to take a windsurfer dagger about the same size as the old style AI dagger, canted it to minimize damage if it comes in contact with something, and plug it in when I'm looking to max upwind performance. Thanks! It's not perfect, but it's fun to play with. That's interesting about the mirage drive fins. I pull my drive out when sailing but have messed around with holding the fins aligned to see if it would help with helm (I get lee helm in my boat, even without the jib). I didn't notice any helm difference, but didn't pay attention to whether or not I could point higher. I'll have to play with that the next time I'm out. Your windsurfer dagger plug sounds exactly what I need. The TI definitely needs a further forward CE. How did you attach the dagger to the plug? I have an extra plug laying around, so I may try this if I can find a dagger board. Nice pivoting hakas. Only thing I would change is the lock nut. I would change it to a wing nut just so i can easily remove it on water. I watched the guys who tested the capsize scenario and I think flipping the kayak back will be difficult with the wood heavy Hakas installed. Here you go. Very simple. Part 2 will be filling the void with foam sealant. The last pic is an approximate distance as located in the hull. Should move the CLR sufficiently forward to restore windward helm. In fact, my results may simply be a shifting from lee to windward helm. I have enough resistance on the rudder that it stays where I put it so can't measure how the boat is balanced with neutral rudder. Nice job, I like that. I also found where someone did something similar with a H16 rudder. I'm going to have to do something like this. Thanks. Some sort of quick release would definitely be nice. I was originally going to use wing nuts, but with the way I have the mounts now, there is not enough room to screw on the wing nut. The aka gets in the way. I'm on my third revision of this mod. They've all worked great, I've just been simplifying it. Maybe on revision 4, I'll use wing nuts! Thanks. I saw the pic with the H16 rudder, it looks “draggy” though I’m sure it serves the purpose well. What are your thoughts about reinforcing the hull forward of the cross member, transfers (increasing) that stress to the aka knuckles and hull in the footwell area? My thoughts with something the size of the H16 rudder is that it could be used instead of the Island centerboard, which would be perfect for my normal lake sailing. The coast, on the other hand, I would then go back to using the Island centerboard, since it'll kick up in the shallows. But yeah, good point about it being draggy. As far as added stress with the bow reinforcement, I'm not worried about the knuckles since the reinforcement is bolted inboard of them and the foot well area seems pretty tough since there's lots of material there. My biggest concerns are the molded in nuts for the bow handle getting ripped out and the cross member and its bolts, which I would think would be pretty stout since it takes a lot of the stress from the mast. Overall I'm not too worried about the bow reinforcement, my biggest concern with the jib addition is the mast, which is why I added the shrouds. I don't use the jib in big winds, so I think as long as I don't get too carried away, it should all be good. Time will tell though! So far, it's looking good after about a year and a half of use. You have to be careful to avoid hitting anything if you have a drivewell daggerboard that doesn’t fold. Drivewell damage is a real possibility. It’s not difficult to make a drivewell cassette folding daggerboard using the AIv1 daggerboard and layers of cutting board bolted together inside the cassette. I copied the shape from the hull daggerboard top slot and used that as template for all the cutting board layers down to the bottom layer which was copied from the slot on the bottom of the hull.